iTarget works with both Apple and Android phones. 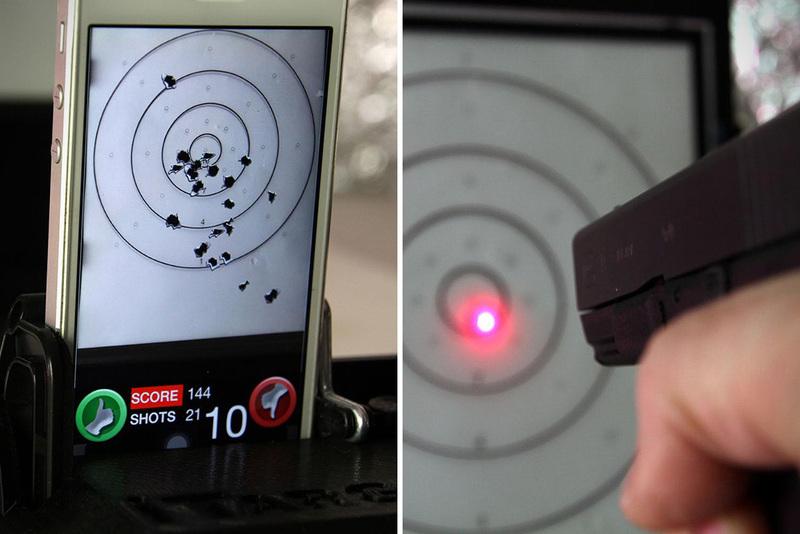 It allows you to train at home with an actual firearm by using the “iTarget Pro” phone app and a laser bullet. The phone is placed into the iTarget sled with its camera pointed at the shooting target. 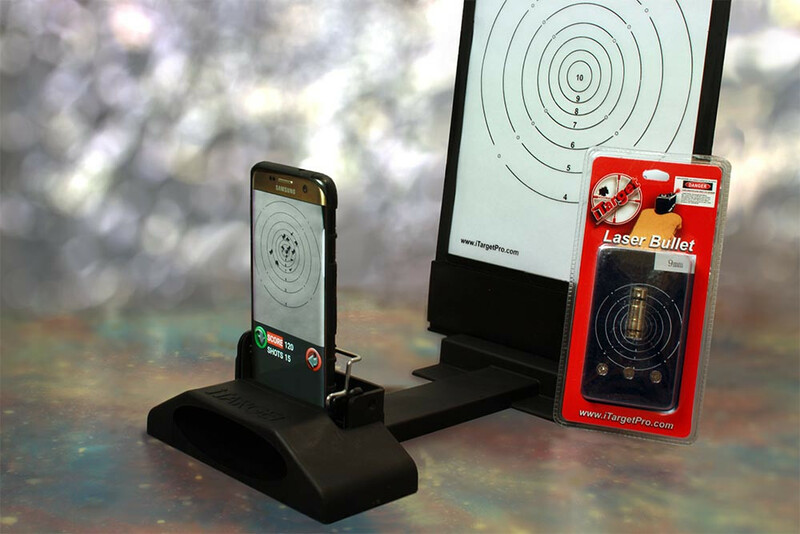 The app monitors the target for hits from the laser bullet and maps the hits onto the phone’s display – showing you precisely where you shot the target. The Laser Bullets are designed without a rim, so they are not ejected by the firearm. They function like snap caps and are harmless to the weapon. The hardened rubber back absorbs the impact from the firing pin. There are currently two ways the app allows you to practice. The first is like a standard firing range. You shoot at a standard scoring Target and the App gives you instant feedback. It shows you precisely where your shots are hitting and you can track your progress by saving your target image to your phone, or share it with your friends. The second is to purchase their “Quick Draw” add on to the app for $4.99. When the App gives the signal, it starts a timer. Your time is recorded for each shot so you can see how accurate and quick you were to the draw. They also have a “High Score” addition in the works, for an additional $4.99. There are five numbered circles. Your training goal is to shoot the number that the App calls out. The iTarget Sled and Laser Bullet Package costs $98.00. Upon ordering, you choose what caliber laser bullet you need. You can also purchase an additional laser bullet or order a different caliber for $59.00. They also have a “gift card” option if you are thinking of buying for a friend.